Perfect in home or hospital for close-up work and wheelchair applications, the front of this table is designed with a 10 1/2 inches deep x 25 inches wide half circle radius cut out for easy accessibility. The 30 inches x 40 inches tabletop has 7 1/2 inches of table surface on each side of the cut out. Scratch-resistant white Melamine tabletop and a raised black PVC edge to keep items on the table. The white table base is constructed of 1 1/4 inches diameter steel tubing providing 33 inches side to side and 28 3/4 inches front to rear to fit wheelchairs. Unextended leg height is 24 inches . Easy-grip knobs adjust telescoping legs up to 44 inches high, and angles, horizontal (0) to 45. Folds flat for storage and/or transport. 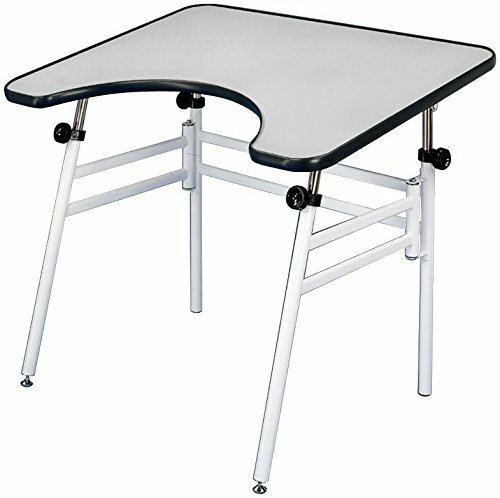 Overall size of folded table without tabletop is 25 inches x 31 inches . Some assembly required. Shipped UPS. 56 LBs. Providing 33 inches side to side and 28 3/4 inches front to rear to fit wheelchairs.